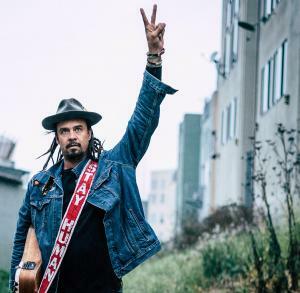 Michael Franti believes that there is a great battle taking place in the world today between cynicism and optimism, so he made his most recent album, Stay Human Vol. II, to remind himself and anyone else who’s listening, that there is still good in the world and that it is worth fighting for. The album has seen early critical acclaim and soared to the top of the charts including, #1 Billboard Independent Album Sales, #1 iTunes Top Albums Singer/Songwriter (US and AUS). The songs on Stay Human Vol. II were inspired by Franti’s new self-directed documentary Stay Human, which has recently won array of awards on the film festival circuit. Stay Human features “heroic everyday people” whose stories have inspired the singer, activist and yoga practitioner during his travels around the world. Stay Human Vol. II is the 10th LP from Michael Franti & Spearhead, featuring the group’s signature sound. It follows three consecutive albums that climbed into the top 5 on the Billboard Rock Albums Chart. He’s also charted five singles in the top 30 on the Billboard Adult Contemporary Chart and had eight songs reach the top 25 on the Triple-A Chart.